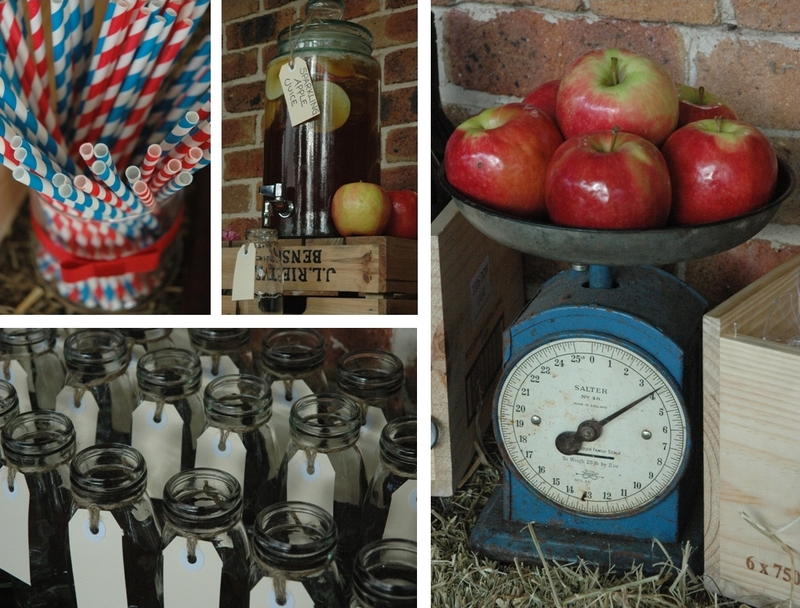 Last Saturday was the weekend of the big 30th country birthday party that we were styling. I had already created the invitations weeks earlier (you can read about that post here,) Trudy had completed the birthday cake which was designed as a cowboy hat, and everything was falling into place for the big day. Sydney had been experiencing some gorgeous weather leading up to the day so I was relatively confident that the outdoor event we had planned would go off without a hitch......Hmm can you sense my overconfidence!!!! Even with all of our planning and detailing we couldn't control the weather, cue freezing temperatures, black clouds and howling wind ! Thankfully it didn't rain though. Picture a huge bonfire with bales of hay for seating, roasting marshmallows, sun setting and people relaxing on the lawn, drink in hand.....NOT ! The wind was so fierce, if we attempted to light the fire I think we would have burnt down half the countryside. The marquee where the dessert table was supposed to be nearly blew away ! We had designed the dessert table to sit beneath the white marquee with a sheer white cotton curtain backdrop, bare tree branches with glass ball votive candles were to be suspended above the table and tree logs were to be used as risers for the desserts. Given the horrible weather, this gorgeous design flew out the window, along with every other outdoor activity. Trudy and I quickly turned to plan B, the bonfire was canned, the dessert table was set up indoors, and the drink station was moved under the verandah of the house, but most disappointingly for us, we didn't get to see the full design come to life. Oh mother nature certainly is a cruel mistress. So, the big lesson for us was to never take the weather for granted and to always have a rock solid plan B, for when everything turns pear shaped. We tied a manila tag with brown string to each of the bottles, the idea being that the guests wrote their name on the tag to "keep their glass for the night". If you have a large party of guests that don't know each other, the tags on the glass make it an easy reminder if a name slips their mind. Some of the props we placed around the property to help enhance the "country" feel. 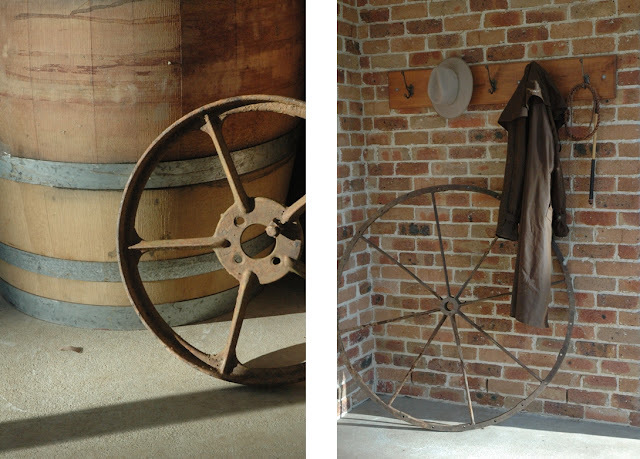 Used wine barrels old steel wheels and the owners driza-bone and Akubra hat. 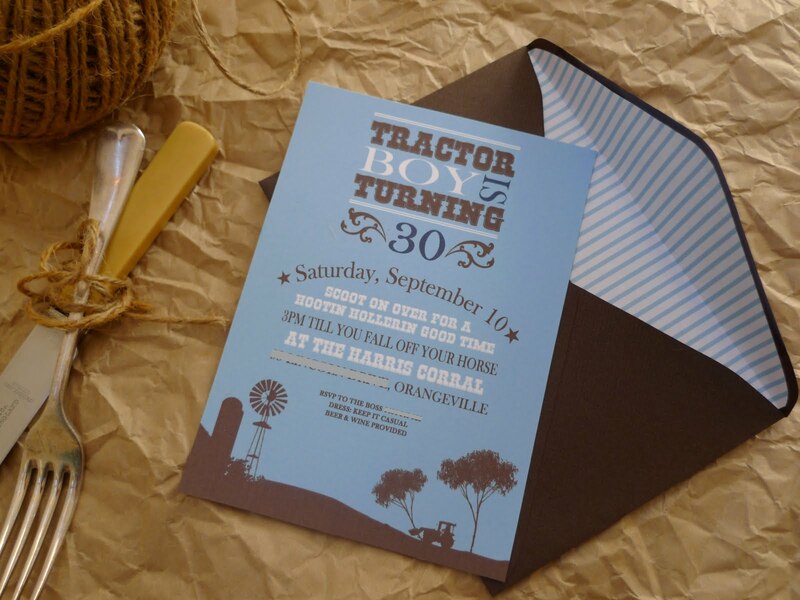 The birthday boy is affectionately referred to as "tractor boy" this was captured in the invitations with the silhouette of the tractor removing trees from the property. The party wouldn't have been complete without the tractor, so we drove it on to the lawn and it worked well as a cheeky reference. The drink station under the verandah. The dessert table was moved inside due to the horrible weather. 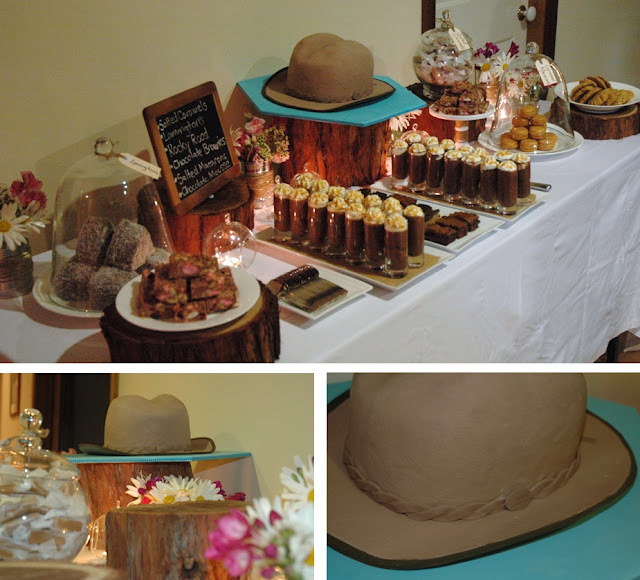 The cowboy hat cake was designed and created by Trudy, and was nearly picked up accidentally by an unsuspecting guest. The cake was a caramel mud cake with white chocolate ganache covered in fondant. The Little Oak Tree designed and catered the dessert menu. The key ingredient was caramel, which we were told was a favourite of the birthday boy. As I mentioned in a previous post we trialled a new recipe from the Miette cook book for the Fleur de Sel Caramels. These were such a success, we should have made two batches.